The text on the website reproduces in a large part ‘Palm Blossoms of Savu’, a booklet I wrote in 2010. The Award I received for my PhD thesis helped to finance the booklet which was translated into Indonesian by Mariah Waworuntu and published by the Indonesian Traditional Textile Society (Himpuman kain adati Indonesia). 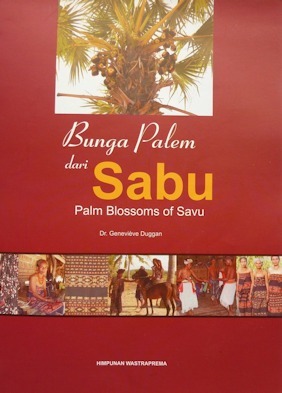 Every secondary and high school in Savu received a set of ‘Palm Blossoms of Savu / Bunga Palem dari Sabu’. I wish to thank Mariah for the translation and her kind support during this project. With the gift of this booklet I was thrilled to be able to give back to the people of Savu the knowledge weavers and adat elders shared with me over 15 years. My thanks go to all who helped me in gathering information and securing the knowledge for future generations. My very special thanks also to Bapak Elo Huma Lado for his role as informant, facilitator, assistant and translator in the field during all this time. Savu society is classified as bilineal and recognizes localized patrilineal descent groups or clans as well as two matrilineal descent lines or moieties (hubi) descended from two sisters. Hubi means literally blossom of the palm tree. The woven cloths women produced throughout time form very much the fabric of Savu society. They are of the ikat type which refers to the tie-dye technique used for obtaining a pattern. Woven cloths reflect the essential role played by women in the society, and moreover by the maternal line, and this since early times of Savu’s history. It is not possible to understand the weaving traditions of Savu without knowledge of the unique social structure of the island. According to the secret and sacred genealogies of the island (silsilah mantra, Indonesian), the society was divided into two groups (or moieties, from the French ‘moitié’, or ‘half’) descended from two sisters, Muji Babo and Lou Babo, a long time before the (male) clans were created. According to collective memory the two sisters were given respectively a large and a small bunch of nuts of the areca palm (pinang, Indonesian) by their older brother, Wunu Babo. Thus Savu had at its origin the classical structure of a matrilineal society where women together with the (ideally elder) brother were in charge of the social organisation of the group. The names of the two moieties were derived from the gift of the areca nut; hubi ae, or ‘large palm blossom’ and hubi iki, or ‘small palm blossom’. The distinction between large and small does not refer to a hierarchical status, or a class, but simply to the birth rank of the sisters. Birth rank establishes an order of precedence, and is a common organisation’s feature of societies in Southeast Asia and more generally in Austronesian cultures. This is noticeable for example in the way people address each other in everyday life in Indonesia using the labels ‘elder’ and ‘younger’ sibling (kakak, adik, B.I.). The division of the society into two female moieties has been transmitted in collective memory in the form of a narrative recounting a weaving competition between the two sisters which turned into a violent fight. As a consequence inter-marriage between both moieties was forbidden. And this prohibition lasted until two-to-three generations ago. This is how the ikat textiles played a vital role as precursors of identity cards (‘KTP kuno’, Indonesian). This tradition has been carried over centuries and is still known by the followers of the ancestral religion, Jingi tiu, which is in danger of being swept away within one or two generations. Identification’s markers of each group are more obvious on women’s sarongs than on men’s hip-cloths (loin cloths). In the former case, the identification’s patterns are visible from a distance while in the latter case, the distinctions may consist on tiny blue and red lines dividing a motif and can be detected only on a closer look or by the trained eye of a weaver.